NASFAT Agency for Zakat and Sadaqat (NAZAS), a non-governmental organization founded to take care of the downtrodden the in society, recently embarked on in its second healthcare mission during its quarterly programme. 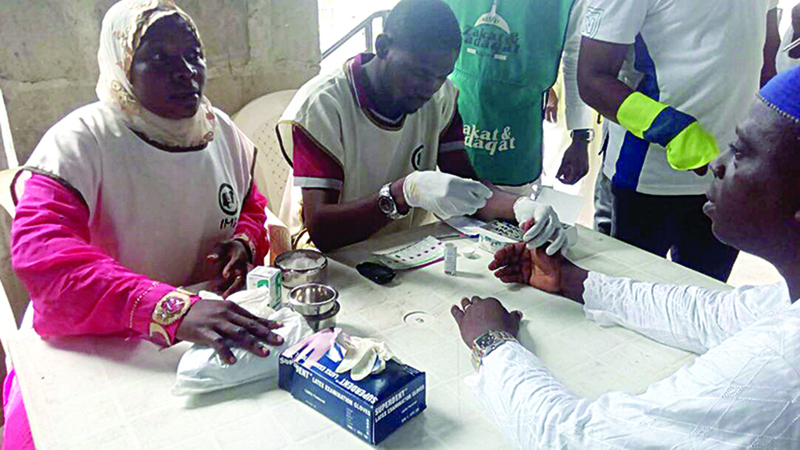 The health outreach, which was carried out in partnership with the Islamic Medical Association of Nigeria (IMAN), took place at the Amuwo Odofin, Lagos branch of NASFAT Society on November 26, 2017 with special considerations to the Hausa Community. At the outreach, over 400 persons benefited from free drugs, spectacles, medical screening and laboratory while 270 children and adults were given de-worming medication. The Medical team was led by the chairman of IMAN, Dr. Mustapha Alibi, who is also the Chief Medical Director of National Orthopedic Hospital, Igbobi, supported by 20 other medical professionals and specialists. The exercise commenced at 10:00am and was concluded by 4:00pm. The Zonal Chairman of NASFAT Zone 2, Dr. Adegbola and other leaders of the NASFAT society were in attendance, with participants expressing their gratitude to NAZAS and its donors whose financial contribution has enabled them to benefit from the free health mission. Established in 2014, NAZAS has disbursed over N131.5m worth of monetary donation, empowerment tools and medication to 516 beneficiaries. In a related development, the management of NAZAS has appointed new management team comprising of a general manager in the person of Mr. Sulaiman Akanni and Dr. Onibon and Dr. (Mrs.) Busurat Adekola as directors with the aim of strengthening the agency as it advances the implementation of its corporate strategy. Mr. Sulaiman Akanni, who resumed in January 2018 as the General Manager of NAZAS, was an accomplished banker with career spanning many years in the Nigerian Banking industry. A versatile administrator, Akanni has two bachelor degrees in Arabic Language from University of Ilorin and another degree in Accounting from Lagos State University complemented with a MBA in Finance. He has varied experience in Finance, Administration, Credit Risk Management, Banking Operations, Internal Control and Client Relationship Management. A prolific author, Dr. Onibon is the Acting Provost of the Michael Otedola College of Primary Education, Epe and member of the Lagos State Pilgrims Muslim Board. Dr. (Mrs.) Busurat Adekola is a national executive officer of the NASFAT Society, Head Part-Time Degree studies and also a former Sub-Dean Faculty of Education of the Olabisi Onabanjo University Ago Iwoye, Ogun State.